SHEPHERD Chartered Surveyors is bringing a world-renowned golf shop to the market for sale as a going concern. 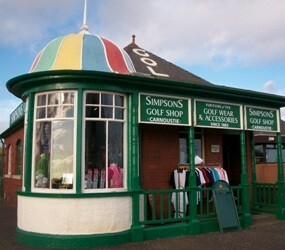 Established in 1883, the Simpsons business is a famous part of Carnoustie’s golfing history. In addition to being a respected professional golfer, Robert Simpson was a pioneering golf club maker and course designer, famously having assisted Old Tom Morris in the redesign of the Carnoustie links. The Simpson family was synonymous with championship golf in the late 19th century, with brother, Jack, winning the Open back in 1884 and brother, Archie, placing second on two further occasions. The family is world-renowned for also being the developers of the ‘Carnoustie swing’, a template of the modern golf swing. In 1920, Robert Simpson acquired the building on the corner of Links Parade, which sits opposite the 18th Green of Carnoustie’s Championship Course, part of the Open circuit. The shop, known then as Charles Brand Clubmakers, was thereafter known as Simpsons Golf Shop and the shop has traded under the family name to this day. Today, Simpsons Golf Shop continues to supply quality golf clothing and accessories to an established clientele along with a regular influx of keen golfing tourists and local golf enthusiasts. The name, ‘Simpsons, Carnoustie’, can be seen on clubs and accessories in golf shops and clubhouses worldwide. The shop was fully refurbished in 2009 and formally opened by BBC Golf Commentator Peter Allis. The property comprises a single storey detached building boasting ornate features both internally and externally, such as the attractive and distinctive golf umbrella dome. Mr Russell said: “Our clients are seeking offers to purchase the business goodwill, including the heritable property. Stock and fixtures and fittings will be made available to purchase separately. Carnoustie sits on the main east coast railway line and is a world famous golf town. The town attracts high levels of worldwide golf enthusiasts as a result.